Place bacon on paper towel lined plate; microwave on HIGH for 5 minutes to render fat. Wrap a piece of bacon around each seafood chunk. For each kabob, alternately skewer 6 chunks with 1 sliced green onion and 2 cherry tomatoes onto a 10-inch skewer. Mix together bread crumbs, paprika and pepper on a pie plate. Roll each kabob in crumb mixture to coat completely. Grill 4-inch from heat source for 10 minutes per inch of thickness of fish or until just done and center flakes with a fork and bacon is crisp, turning occasionally. 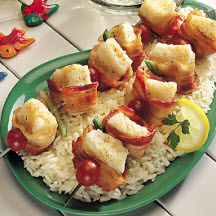 Recipe and photograph courtesy of Alaska Seafood Marketing Institute.